Just as a I was drooling over a photo of the cobb salad The Pioneer Woman posted on Facebook today, and fretting over the fact that I can’t find a good one at any restaurant in the small town we live in, my husband called from the grocery store and asked me if there was anything I wanted him to pick up for dinner. I don’t know why he was there, probably looking over the new releases in the Red Box, but his timing couldn’t have been better. 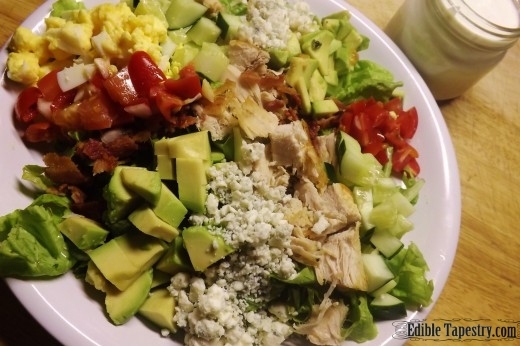 I ate, or tried to eat, a lot of cobb salads when I was pregnant with each of my boys because we had a Red Robin restaurant in the small Washington town we lived in. My stomach was so iffy during those pregnancies that the only item on their menu that sounded appetizing to me at the time was a cobb salad, though I could never eat more than a few bites of one at a single sitting before the queaz, as I called it, would hit me again. But I still loved that salad and have never found one on a menu to equal it. The list I emailed my husband while he waited in the store was surprisingly simple, consisting of the things I don’t have in the garden. For cheap, easy, and lean meals, I’ve taken to roasting whole turkey breasts before portioning and freezing them, so pulling out a foil packet of meat to thaw and lightly grill for our salads made our yummy dinner even simpler to prepare. 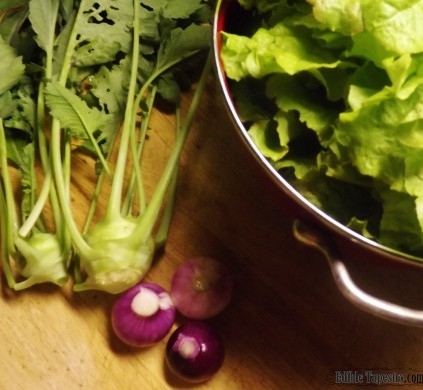 I boiled an egg for each of us, and harvested what I needed from the garden, finding two kohlrabis ready to be brought in along with my salad ingredients. Appetizers! When my husband came in with the groceries, I cooked six pieces of bacon, one of which my teen boys nibbled before I could crumble it into the salads, and threw together the ingredients for a quick dressing. The salad included bib lettuce beds as a base, with sections of diced cucumbers and boiled eggs, quartered cherry tomatoes, small dice red onions, crumbled cooked bacon, crumbled blue cheese, and diced avocados portioned over each. I wish I could grow avocados in the mountains. 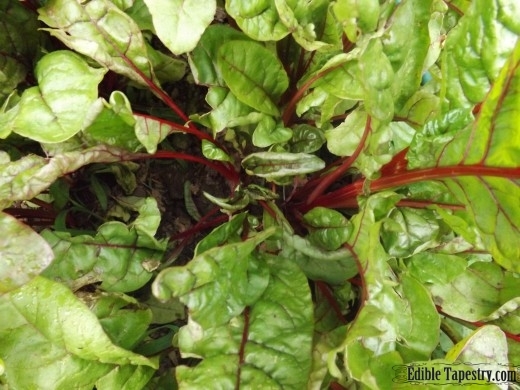 It’s much too cold, but we have been eating a lot of Swiss chard, mustard greens, and baby spinach from the backyard. 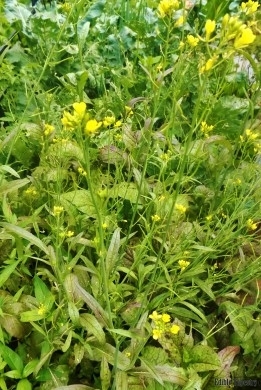 I’m allowing most of my mustard to go to seed so I will have them for planting and grinding into mustard. I add sour grape juice from my largest vine, which I believe to be native Norton, to make a Dijon-style mustard. 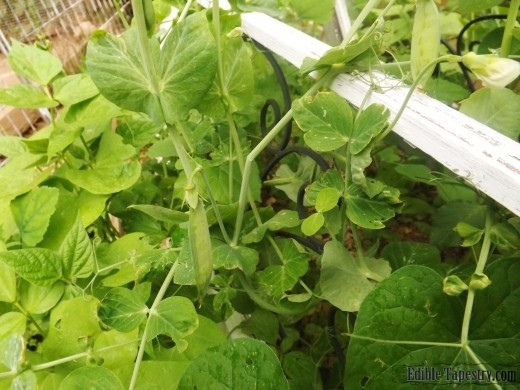 As I strolled through the garden this evening, I saw that the first of the peas are ready to be plucked. Maybe for tomorrow night’s “gardener’s supper”. It’s very late in the season for them, but I didn’t get them in till mid-May. 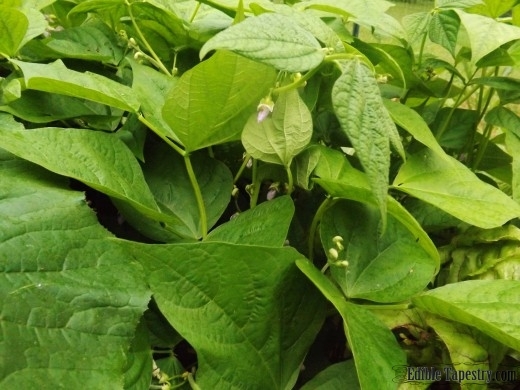 My beans are showing their pretty purple flowers, telling me that we should have them for Sunday dinner, Independence Day weekend. The hops I found at this year’s Asheville Herb Festival are going crazy, as hops should, though the older leaves are getting a little bug-eaten. And these guys may be the culprits. 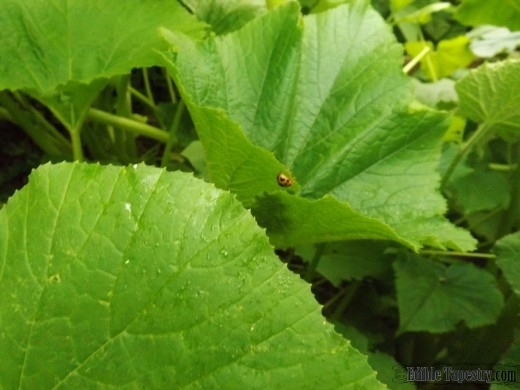 That’s not a ladybug, which would be good for my garden, it’s a Mexican Bean Beetle, sitting on one of my gigantic zucchini leaves. Every…single…year. 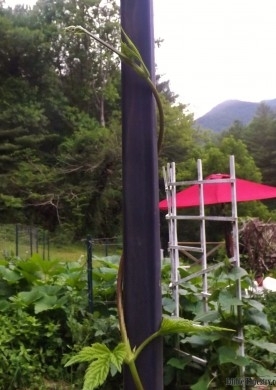 And they will destroy all of my squash plants if I let them. My delicata, cucumbers, zukes, pumpkins, and butternut. I have a little trick up my sleeve that I learned from a veteran farmers market seller last summer where I spent most of my Saturday mornings. Geranium oil. 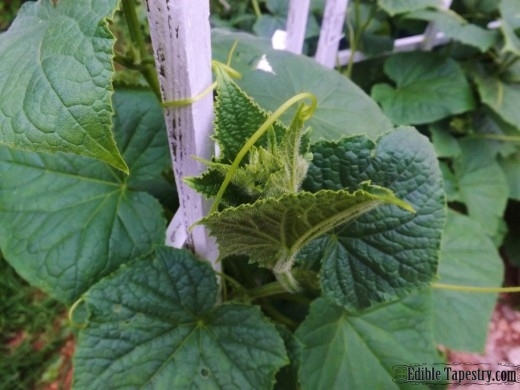 I’m going to try mixing it with a homemade, non-toxic insecticidal soap to see if I can keep those squash munchers away this year. I always find it funny that they are called “bean beetles” but never, ever touch my beans. 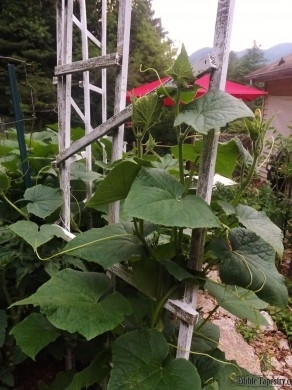 My cucumbers are pretty growing up the trellis I made for them with two sections from the home improvement center and a short picket fence I bought at an estate sale in a little seaside town in Washington. 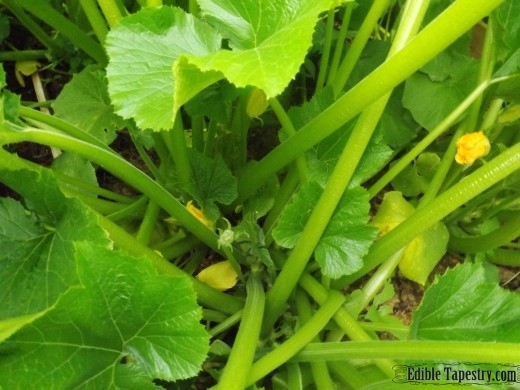 The zucchini will be popping up before I know it, if I can take care of those beetles. 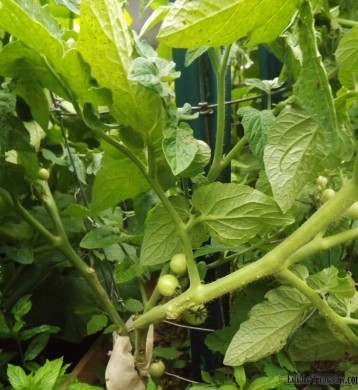 I am also growing Roma and Better Boy tomatoes, but I planted them too close to the ducks’ fence so as soon as they sprout out, the tops get eaten off. I think I will line that portion of their fence with chicken wire so the Bickersons can’t get to them. 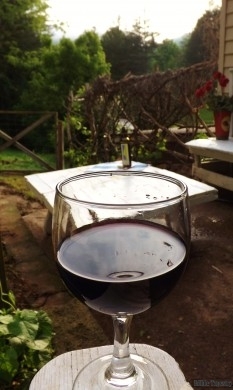 When I’m done hoeing and pruning and weeding and trimming on these, now sticky and uncomfortably warm summer days, I have this nice little spot under my big, red umbrella, overlooking my grapevines, to sit and take a breather. I certainly am one lucky farm girl!